We recently added Hunky Bingo to LBB and we thought our members would be interested in some extra insight into the man candyâ€¦er uhâ€¦brand. Take your eyes off of the manly men on Hunky for just a moment to say hello to Mack at the newer sister site, Zinger Bingo. Mack is the macaw that welcomes players to this tropical gambling destination. Both powered by Dragonfish, each site offers great things in terms of bingo and slots as a result of the multi-software platform. We'd like to thank Greg of Hunky and Zinger for taking the time to answer our questions. 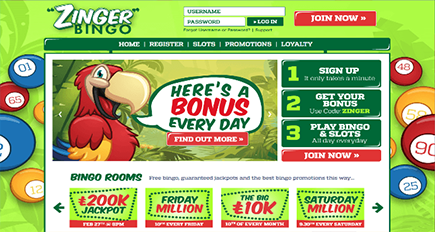 Q: As new additions to LBB, please tell our members a bit about the Hunky Bingo and Zinger Bingo brands, when they launched etc. A: Hunky Bingo launched in May 2015 on the premise of wanting to offer a bit more cheeky fun and a bit of eye candy to players. When I first heard the name I thought LGBT Bingo site, I was wrong, it's not specifically targeted at any one except those who enjoy a bit of male eye candy and of course quality bingo games. Zinger Bingo was released in March 2016 and Mack that Macaw is a result of the Hunks at Hunky, we wanted to try out a different concept and did not take it as far as we wanted. The Rainforest, Macaws and Bingo. An unlikely mixture but players do seem to be enjoying Zinger. 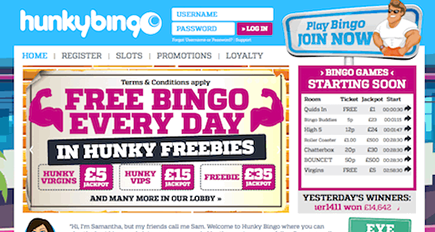 Q: The design of Hunky Bingo is really fun and filled with luscious eye candy. How was the muscle man concept born? A: The concept as with all great ideas (and this might be one) is really simple - we wanted to attract a majority female player base and wanted to titillate and amuse them with some Eye Candy. We sent out a Weekly Hunk email that was very popular. The initial site also showed real male models, we have moved that to cartoon figures on the current site. It seems to look better and attract a lot more female players. Men get a ton more of this kind of thing in everyday life, we thought why not offer it to the ladies via bingo games. Q: Considering the design of Hunky Bingo, would you say that the majority of overall bingo players are female? A: Oh Definitely and that's what we wanted from the word go. No offence to any gentlemen reading this, we like female bingo players and the concept was created for them. That being said, there is a decent sized male community playing regularly. Perhaps they also enjoy the Weekly Hunk mailer and why not. Q: With so many Dragonfish powered brands out there, which features of Hunky and Zinger set them apart from the rest? A: Apart from the design factor and titillation factor, our bingo rooms have a decent rewards program. We also have our own dedicated bingo rooms that players can play special bingo jackpot games. Being part of the network makes it a little difficult to stand out but we do offer a massive sign up bonus, better than most Dragonfish rooms. Q: Dragonfish powered sites have a rule that doesn't allow players from certain countries to withdraw more than the amount of their deposits. This is viewed as a disadvantage to those players so what do you say to them and why do you think this rule is in place rather than including them in the list of restricted countries? A: This is not a rule, it is a right to reserve policy due to credit card fraud in certain countries. In addition, the majority of these countries are not known for playing bingo games. I don't want to highlight any particular country in this interview as it would be unfair, but any persons playing bingo from these countries are generally fraudulent. These rules have never been enforced at our Bingo rooms and we trust that they never will. Q: Winning a jackpot is every gambler's dream, right? Tell us about the largest jackpots on record for your brands or perhaps the most interesting reactions. A: One of our biggest single slots winners hit a massive £50,000! Another recent winner won over £22,000 on Fluffy Favourites - they were obviously delighted with the win! When we spoke to her, she said she bought a new fridge and freezer straight away, and she had an eye on a water bed - it's funny what our players like to spend their winnings on! Q: To many of us slots are just as important as the bingo. What are the top 5 most popular slot games among your players? A: We're constantly adding new slots games for our players so our top 5 slot games changes all the time! But then there are always those slots that prove popular, time after time - the classics! Slots like Starburst and Fluffy Favourites are always popular, as is Magical Forest - which is why we keep rewarding our players with Free Spins on this game! Some of the newer titles that we've added that have caught our players attention include Neon Staxx and Aloha! Cluster Pay and the new Fluffy Too slot. Ask me again next week and we'll most likely have some other new games that top the list! Q: Is there any inside information regarding special promotions, big jackpot games or future plans you can leave us with? A: Our promotions team are always working on new ideas for special promotions, whether they are daily bonuses to reward our loyal players, or exciting offers for new players. The European Football Championships and Olympics are obviously two huge events in the calendar this summer, so we'll be lining up very interesting bonuses to coincide with these! You will be able to find out about them first at LBB is what we can say. That's all I can tell you for now, but we'll reveal more shortly!